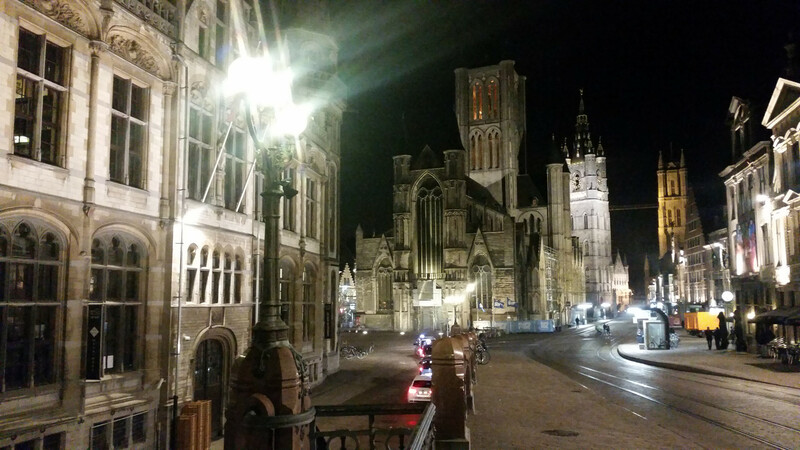 I went on a trip to Ghent, Belgium this week, to attend a conference at the Artevelde Hogeschool. I had been invited to give a speech and to offer a workshop on H5P. The journey was great, but it felt so weird, that I’d just like to share my experience with you. There was nothing that was really extraordinary — sorry if you expect that — but in total the small bits and pieces formed a worthwhile journey. Actually, everything started last weekend in Tromsø, Norway. That’s where I live. The sky decided that it was time again to cover the city in some new snow. If I say „some“, then I mean quite a lot for someone who spent most of his life more than 15 degrees of latitude further south. 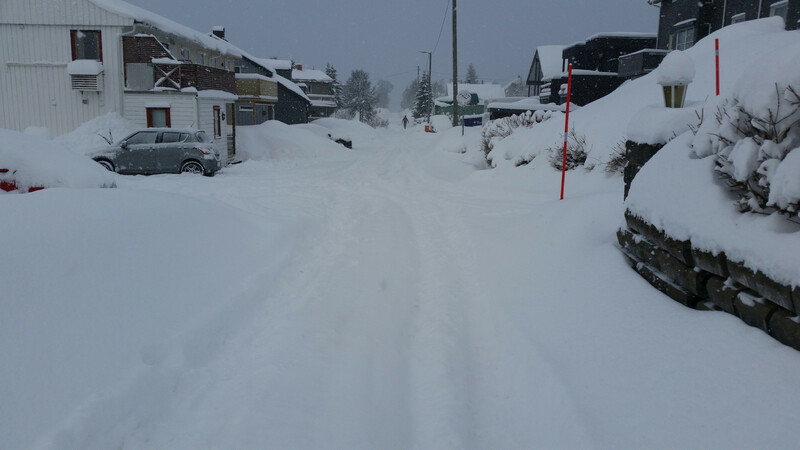 In these conditions, public transportation in Germany would have come to an immediate halt, but the Nordmenn didn’t care at all. My plane departed right on time before noon on Monday. It was close to 22:00, and I decided that it was time to finally eat something, and the first place that I found on my way to the hotel was a kebab joint. It’s run by a very nice fellow. We chatted a little bit about what I was doing in Ghent, and he tried to buoy me up — although I have done it dozens of times, I still don’t feel comfortable giving speeches. He said, the most important thing was to be happy, and he suggested I should visit him again on Wednesday before I went back home. I did, and I will not forget to tell you more about that encounter later. The day was not quite over, but unscrambling some reservation issue at the hotel and putting one more hour into the preparation of my speech are hardly worth mentioning. On Tuesday morning, I woke up by the sound of my alarm clock. That’s rare. I am usually awake before, so I must have slept like a stone. As a result, I decided to get some more minutes for snoozing. I could still hurry a little bit to get to the conference on time. Bad idea. Performing my morning routine in the bathroom in 4th gear led to me losing one of my contact lenses. On the sink? On the floor? I couldn’t find it and still don’t know where it has ended up. And, of course, I didn’t bring spare ones. Since I didn’t have time to get new lenses, I decided that one of these a hundred and forty six other things would be to remain short sighted and to turn it to my advantage. My speech had a section about accessibility of software anyway, and now I didn’t even have to play being visually impaired when demonstrating it. The speech went well. So I was told at least. I was not content with my performance, but I don’t think I have ever been after giving a talk. It’s not my thing. I prefer what followed next. I joined Thomas, Dries, Frederic, and some others to the learning café where the congress attendees could hang out and learn about some of the technology that Artevelde Hogeschool uses: Panopto (a video platform for education), Canvas (a learning management system) and H5P. Some people approached me with questions about H5P, we discussed some aspects, and I demonstrated some features. Very nice! Afterwards, we went to a restaurant, and that’s where we met him: Melbourne-Man! There was this Asian looking guy who at some point started to chat with us about how great the Belgian lifestyle is — he meant good food and affordable beer. He obviously missed it in Sweden where he lives and works. And he laughed a lot whicht might have been related to the beer. But, more importantly, it turned out that he was from Melbourne, Australia! That’s where the next H5P conference will take place. We got many hints about what we shouldn’t do (road trips are supposed to be boring) and what we should do when we’re down under (kangaroos, of course). And for some reason he was very fond of meat pie which we should definitely try. Melbourne-Man, it was a pleasure to meet you! On Wednesday, I went to a different location of Artevelde Hogeschool closer to the city center. 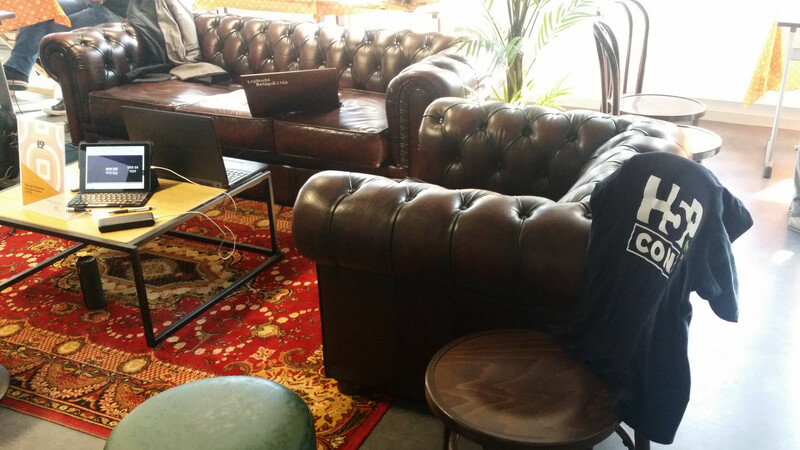 That’s where the H5P workshop took place. I knew beforehand that there would be some people without prior knowledge of H5P and some who had been using it for quite some time. I didn’t want anyone to be bored, so I prepared some practical environment where newcomers could explore the basics and the experienced guys could fiddle around with several features and content types that have not yet been released. Of course, I also answered some questions and demonstrated some things, too. I liked this workshop much better than the speech. Afterwards, I still had a little time to explore the city of Ghent on my own. It’s really beautiful. With all the cobblestone and the tram, it reminded me a little bit of Braunschweig, Germany where I lived quite a while, but the inner city of Ghent felt bigger, and it had canals running here and there. I wouldn’t have minded to stay longer. The train ride and the flights went well, and I was looking forward to getting some sleep. Unfortunately, all the gates at the airport in Tromsø were blocked by other planes and we had to wait some time until one was cleared. Not very long, but long enough for missing the last bus to the city center that departs briefly after midnight. And what do you do if you’re me and you don’t want to wait for a cab? 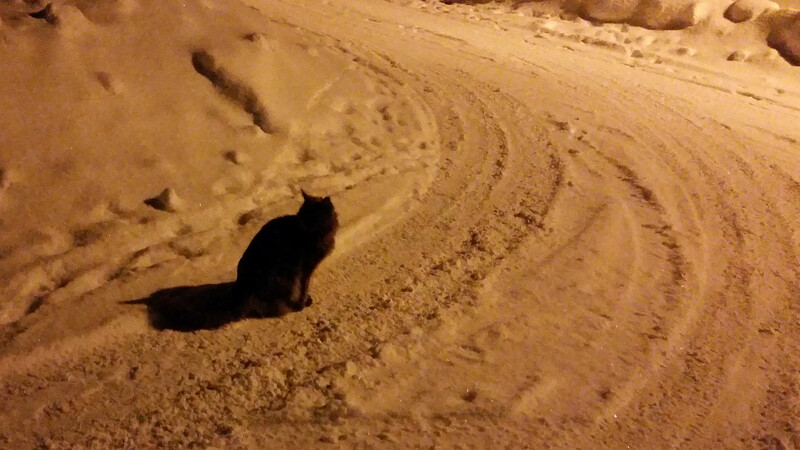 You decide to walk home :-) That meant tramping up a hill through snow for over an hour, but it was worth it: Close to my place, I met an adorable Norwegian forest cat who seemed to be glad to have found someone she could chase and play with in the middle of the night. Dieser Beitrag ist vor allem für all diejenigen unter euch gedacht, die überlegen an meinem Workshop namens „Offene Seminare in Wikis“ am 14. Oktober 2015 bei der Tagung Verflechtungen II — Medien, Bildung und Wissen in der Hochschule teilzunehmen. Ihr könnt hier einen besseren Eindruck davon gewinnen, was euch erwartet. Wenn euch das zusagt, könnt ihr euch anmelden.